Let's talk makeup- I rarely do, but these products are too good to keep to myself. 1)I recently started using YSL's cult classic touche eclat and I have to say, I don't know why I hadn't sooner. It's so much more than a concealer and it really "wakes me up" unlike any other product I've ever used. I'm obsessed and since I can't believe I didn't pony up and purchase it earlier, I'm urging you to try it next time you're at the makeup counter too. I think you'll love it like I do if you don't already! The other two products below are similarly rave-worthy. 2) I'm not a foundation person and have never been able to find a product that really worked for light, non-makeupy feeling coverage while also providing SPF. I have found a miracle for my sensitive skin in Chanel's Hydramax tinted moisturizer. I'm ashamed at the price, but honestly, I've never found a product that is so darn usable and well suited for my routine. My mother always said taking care of your skin is an investment so I consider this product precisely that. 3) I use this lash booster under my mascara and can't tell you how much improved my lashes look. The bonus is that you can use it with literally any cheapo mascara brand you want and you still look like you've used false eyelashes. Extra credit is that is protects your lashes from drying out of you use mascara everyday like I do. 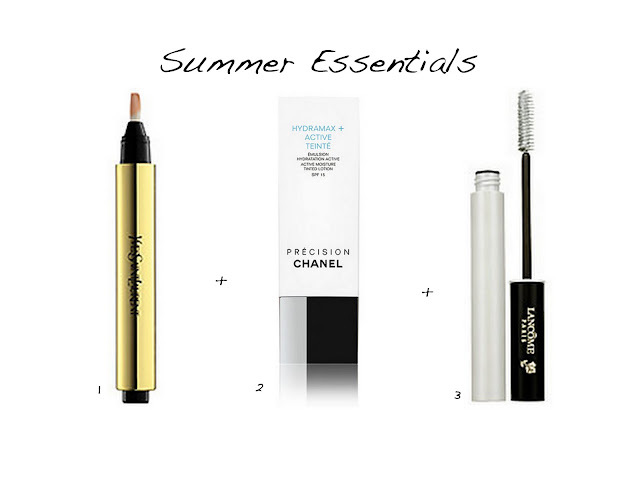 I know I titled this post summer essentials, but really I think I'll use these products year round. What are the go-to's in your makeup bag? I need some new lash booster!! Mine just isn't cutting it these days! Thanks for the recommendation!! I'm a big fan of touche eclat!!! Can't wait to try these other two. I think my routine needs a touchup. I'm pretty much all or nothing these days and most days it's nothing. I need to find a new tinted moisturizer. Not loving my Bobbi or Trish these days.